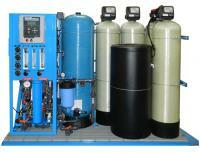 Reverse Osmosis System Manufacturer - Custom & Commercial RO Systems | Applied Membranes Inc. 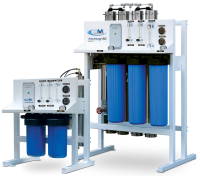 Applied Membranes manufactures Reverse Osmosis Systems (RO Systems) ranging from 24 gallons to millions of gallons per day, treating municipal, well, surface and sea water. Reverse Osmosis is a water purification process in which feed water is processed through a membrane. This membrane stops contaminated water, cleaning solutions and undissolved materials from passing through. The clean water is sent along to the point of use and the contaminants are discharged to a drain. The process, combined with pre-filtration, is able to remove 90 to 99.99% of the dissolved impurities that reside in your water. Please choose from your application and flow range below to view our systems in your size. AMI Point of Use Home RO Systems provide a continuous supply of clean, fresh drinking water for installation under the sink or in a nearby location. The product water is used in applications such as spot free rinse, water stores, whole house, labs, ice makers, humidification, misting and a wide variety of other applications. 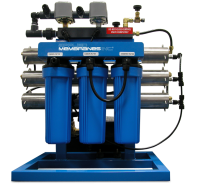 Designed to produce low dissolved solids water from high TDS tap or well water, these wall-mounted systems use high efficiency reverse osmosis membranes. 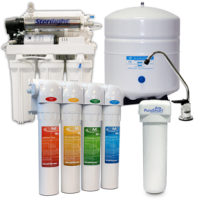 Advantage RO Systems incorporate carbon filters for chlorine removal and sediment pre-filtration for a packaged unit ready to run out of the box. AMI Low Energy RO systems run at 100-140 psi and are used in spot free rinse, water stores, whole house, labs, ice makers, misting and more for feed water up to 500 ppm TDS. 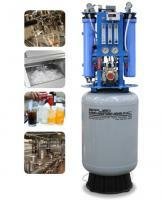 HL Series RO Systems for High TDS Feedwater of 1,000 to 5,000 PPM are used in spot free rinse, water stores, whole house, labs, ice makers and more. AMI PW Series mini RO water purification plant is assembled on a skid for use in water stores, water jet cutting machines, pharmaceutical, and more. J Series Commercial RO Systems produce 7,000 to 28,000 GPD and are used in applications such as food processing, bottled water, beverage, rinse water, and more. AMI Industrial RO Systems produce low TDS water for use in semiconductor, boiler feed, pharmaceutical, municipal, food processing, plants, and more. This unique space-saving design allows for easy servicability and produces 1,000 GPD of high quality water for commercial food & beverage applications.